This recipe meets all 5 of the steps to a healthy dinner. 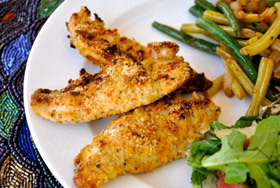 By baking the chicken and using low-carb flours, this recipe has half of the calories and 80% less fat than traditional fried chicken. Serve with a side of vegetables and a salad. Preheat oven to 350 degrees F. Lightly grease a 13″x9″ baking pan with coconut oil. In a medium bowl whisk the eggs, apricot preserves, mustard, garlic powder, and red pepper flakes. In another medium bowl combine the almond flour, almond meal, coconut flour, pepper, thyme, paprika and salt. Dip each chicken tender in the egg mixture, then dredge through the flour mixture. Place in the prepared pan. Bake for 35 minutes. Change oven to high broil for 2 minutes, flip each chicken tender and broil the other side for 2 minutes. Serve with a side of sugar-free BBQ sauce or organic honey mustard. Nutritional Analysis: One serving equals: 256 calories, 6g fat, 376mg sodium, 5g carbohydrate, 2g fiber, and 39g protein. Temptations abound when you eat out. There are bread baskets, and chip baskets, and appetizers, and desserts. In order to maintain your healthy diet you’ll have to have a plan in place before arriving at the restaurant. Think you’re eating healthy meals, but aren’t sure? If your weight loss has slowed, or even stopped, then there’s a good chance that you haven’t been eating as healthy as you should be. I’m going to end the guesswork for you, once and for all, with my 5 steps to a healthy meal. By following these 5 guidelines you’ll know that your meals are healthy and fitness friendly. And as a result you’ll experience healthy weight loss. These are the building blocks to a healthy meal. While you certainly don’t need to dine in gourmet restaurants in order to ensure quality ingredients, you should pay attention to the quality of the foods you eat. Protein helps you feel full longer, it regulates blood sugar and helps repair any damaged tissue in your body. Make sure a 1/3 of your plate is loaded with a quality source of protein. With the first 2 guidelines in mind, these will be high quality, healthfully prepared. Fiber is a huge part of eating healthy and being lean. Whole, fibrous foods will fill you up while delivering numerous vitamins and nutrients in low-calorie packages. Fill at least two thirds of your plate with fibrous fresh fruits and vegetables. Here’s where many well-meaning dieters lose it. The facts are simple, in order to maintain the healthy carb and protein diet required for healthy weight loss, there is no room for starchy foods. Cut the spaghetti squash in half, and scoop out the seeds. Run water over the insides of the squash. Microwave each half, separately, for 5 minutes. Use a dishtowel to remove from microwave – it will be HOT! Set aside to cool, then place in the fridge for at least 15 minutes. In a food processor, combine the basil leaves, pine nuts, and garlic. Combine while you drizzle in the olive oil. Add the lemon juice and a dash of salt. Once a paste forms, remove from food processor. 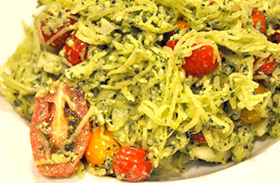 Scoop the cooled spaghetti squash from its skin, and place into a large bowl. Use a knife to cut up the large bunches of squash. Thinly slice the fennel bulb into 1 inch segments and add to the bowl. Mix in the pesto until everything is well coated. Cut larger cherry tomatoes in half, and leave smaller ones intact. Add all the tomatoes to the bowl and mix well. Taste the faux pasta, and use another dash of salt if needed. Nutritional Analysis: One serving equals: 80 calories, 3.5g fat, 88mg sodium, 12g carbohydrate, 3g fiber, and 3g protein. If so, then you’re likely taking in more calories than you need-resulting in weight gain. New studies suggest that eating while distracted by TV, texting or driving results in consuming as much as 40 percent more calories. Eliminate distractions while you eat for easy weight loss. Maybe you think your calves are too skinny or you hate that your thighs rub together and your buns jiggle when you walk. Whatever you don’t like about your legs, it isn’t going to fix itself. So how can you fix it? Include strength training for your lower body in your regular routine. To sculpt and tone your legs, try the following five exercises two to three times a week and see the difference they make. You’ll be showing off those legs in no time. Step forward several feet with your right foot, landing heel first. Bend your right and left leg down until both legs are bent at 90 degrees (never more) and your left knee is about an inch above the floor. Make sure your knee doesn’t extend further than your toes. Keep your body upright and work to keep your balance by not wobbling from side to side. Lift your body up and bring your hips forward until you’re standing straight again. Then repeat, lunging forward with your left foot. Here’s how to do a beginner’s squat. Stand between two chairs (if needed for balance). Place your feet shoulder-width apart. Pushing your hips back to place the weight on your heels, squat down like you’re going to sit in a chair. Keep your back straight, chest up, and core tight. Bend at the knees until your thighs are parallel to the floor. Hold this position, and then stand back up. Repeat without resting. This leg exercise mimics the movement of climbing a steep mountain. The faster you climb (move your legs) the more of a cardio workout you’ll get as well. Step-ups are great because they mimic movements you perform on a daily basis. This exercise works your legs and gets your heart pumping. When you do this exercise you can hold a dumbbell in each hand to increase resistance. In addition, you’ll need some sort of step. This could be a bottom stair, sturdy box, or low stable chair. To do the carving curtsy, stand up straight with your arms bent and hands by your chest. Lunge back and to the right with your left leg so your left foot lands behind your right foot and to the right of your body. Bend both knees to a 90-degree angle like you’re performing a curtsy. Swing your left arm forward and up and your right arm back by your side. Then stand up straight, lifting your left knee out to the side, and tap your left knee with your left hand. Do 20 reps on each leg, and then switch sides. If you’re ready to begin your body transformation then feel free to reach out to me. Email or call to get started today. Place a non-stick skillet over medium heat. Cook the bacon strips for 4 minutes each side, until golden. While bacon cooks, dice the apple. Remove bacon strips from skillet, place on a cutting board. Place the apple pieces in the heated skillet and sauté for 5 minutes, sprinkling with a dash of cinnamon. Dice the bacon and place in a medium sized bowl. In a bowl whisk the egg whites, whole eggs and coconut milk. Beat the eggs until frothy and add dash of salt and pepper. Remove apples from skillet and add to the bowl of bacon. Pour half of the egg mixture in the skillet, cook until set and then flip and cook the other side. Repeat with the other half of egg mixture. While eggs cook, mix the bacon, apples and goat cheese together. 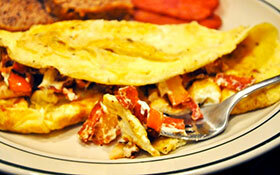 Fill each omelet with half of the bacon, apple and goat cheese mixture. Nutritional Analysis: One serving equals: 249 calories, 12 fat, 485mg sodium, 10g carbohydrates, 1g fiber, and 25g protein. If you’d like to see your fitness goals become a reality then pick up the phone or shoot me an email. Call or email today to get started on an exercise program that will truly deliver the results you deserve. 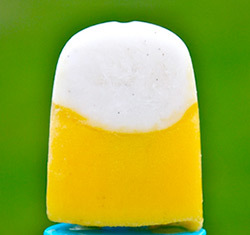 Fill the bottom 1/3 of each Popsicle mold with yogurt. Freeze for 15 minutes. In a high-speed blender, combine the orange, pineapple and agave nectar. Blend on high speed for a full minute. Fill the remaining space in each mold with the orange mixture. Freeze until solid. Nutritional Analysis: One serving equals: 76 calories, 0 fat, 10mg sodium, 11g carbohydrate, 1g fiber, and 3g protein.